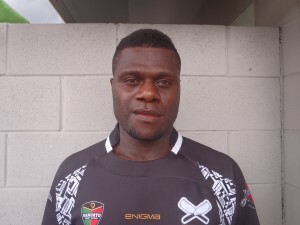 Local Santo hero Jean Pierrez Kenie will headline a list of 13 locally based players to form the 21 man squad to take on the Philippines Rugby League team, the Tamaraws at Chapius Stadium on Saturday 11th October, 2014 in Espiritu Santo (Vanuatu). Kenie who hails from Port Olry Village has been selected in the squad following strong performances in Vanuatu’s Test victories over Solomon Islands and Niue in 2013 and strong form for the Fassifern Bombers in 2014. The versatile Kenie can play in the front row, second row or lock and is also a noted goal kicker being famous for kicking goals from the sideline with both his right and left foot. Kenie rose to prominence having been spotted by national selectors playing for the Santo Boars against the Port Vila representative team back in 2012 in the first installment of the annual inter-provincial fixture as the curtain-raiser to the inaugural Test match against Greece. The match will again feature in 2014 with Santo looking to reverse the results of 2012 and 2013, have the home ground advantage for the first time. Kenie was very excited about the opportunity to play in front of his home crowd in October. “The VRL has provided me several fantastic opportunities to further my Rugby League in Australia, including my current great opportunity with the Fassifern Bombers and in the national squad over the past three seasons. I can’t wait to get the opportunity to get out in front of the whole of Santo and play for my country again, it’s going to be great”, Mr Kenie said. Kenie will be joined by his Fassifern Bombers teammates in Sweeny Sablan, who played both Test matches in 2013 on the wing and young Xavier Philips who will be looking to make his Test debut. Test centre Nelson Law who spent the year in Australia with Queensland Cup outfit the Tweed Heads Seagulls A Grade team, has also gained selection. Veteran and prolific try-scorer Jason Pakoasongi will be looking to add to his incredible record of playing and scoring in every one of Vanuatu’s Test matches to date. Pakoasongi a lawyer with the State Law Office just seems to get better and better each year which defies his 37 years of age and place as the elder statesman of the team. Interim coach and former player John Nash was very pleased with the final 21 player squad selected. “We’ve got a great mix of experienced players and young talented players that have improved dramatically over the past few years. It will be a tough match against the Asian champions but on the back of a large and boisterous home crowd, I think we might just surprise a few people”, Mr Nash stated. Tickets can be purchased at The Espiritu hotel reception (Ex-Apex) or at the gates on game day. Half-time entertainment will be provided and there will be food and beverage (alcoholic and non-alcoholic) for purchase on game day. Includes full buffet dinner, live entertainment, jersey auction and chance to meet all the international players. This entry was posted in Uncategorized on October 3, 2014 by Ben Howard.